Port Macquarie has a lot to offer its visitors, being one of the main towns along the East Coast it’s popular with backpackers and road trippers so it was inevitable that we would end up spending a day or two there. It also meant we had time to visit Port Macquarie Koala Hospital where we got to meet their patients and find out more about what the hospital does for these beautiful animals. After our visit, we walked away with heaps of respect for the volunteers and a new found fondness of the fuzzy Australian ‘bear’. It’s no secret that I’m obsessed with wildlife. Seeing new and exciting animals is a big priority for me when we’re travelling and coming to Australia meant I would finally be able to finally see the iconic Koala in real life. They’re one of the ‘big three’ when it comes to Australian wildlife, alongside Kangaroos and Wombats, but did you know that their numbers are rapidly declining? It just so happens that September is ‘save a koala month’ too, so here’s our dedication to this little koala lifeline, including tips to help you make a difference, links to charities you can support and a few cute photos from our visit to the Koala hospital too. What is the Port Macquarie Koala Hospital? Beyond the obvious (…it’s a hospital… for Koala…), the Port Macquarie Koala Hospital is a non-profit foundation run by volunteers. They rely hugely on donations from the public and without the support of visitors and volunteers alike, they wouldn’t be able to save as many animals as they do. Not only do they rehabilitate the injured Koala, but they also care full-time for those too ill to be released and work alongside researchers who are looking into the cause and spread of Koala diseases. Port Macquarie Koala Hospital is open every day 8 am – 4:30 pm, we arrived pretty late in the day, at 3 pm, which actually turned out to be the best time to go. 3 pm is when they hold a guided tour around the property, it’s possible to walk around on your own throughout the day but on the guided tour you’ll learn a lot more about the individual Koalas, why they’re there and when/if they’ll be released. 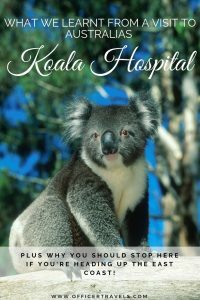 There are several different sections to the Koala Hospital, some you’ll not be able to see during the tour; The intensive care unit is off bounds due to the severity of the sickness and injuries to the Koalas there and the rehabilitation grounds are screened off to prevent the Koala who are about ready to be released getting too used to seeing humans, however, because they’re almost well enough, you’ll be able to see these almost wild again Koalas up in the trees practising their best snooze balance on the branches above you. 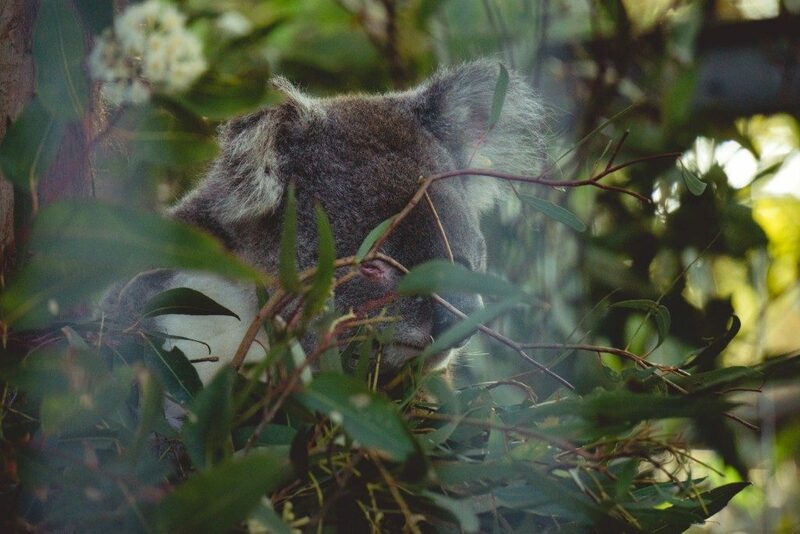 So what will you see on a visit to Port Macquarie Koala Hospital? 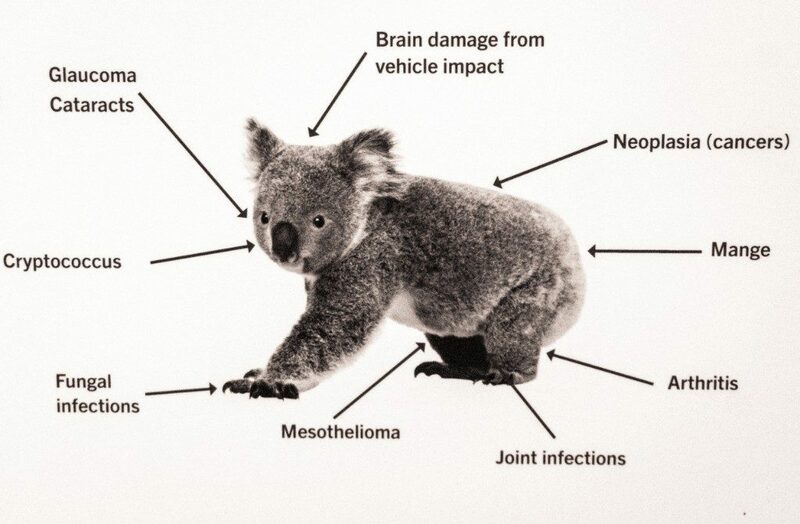 Well, you’ll be able to meet their very cute resident Koala, these are the unfortunate (yet somehow lucky) souls who have been injured to the point they can no longer luck after themselves in the wild. From a Koala who only has one back leg, to a little guy who’s completely blind, you’ll hear their heartbreaking stories and be able to see them being fed their treats for the day. Once you’ve met the full-timers you’ll be able to see where the healthy Koalas go when they’re almost ready to be put back into the wild. 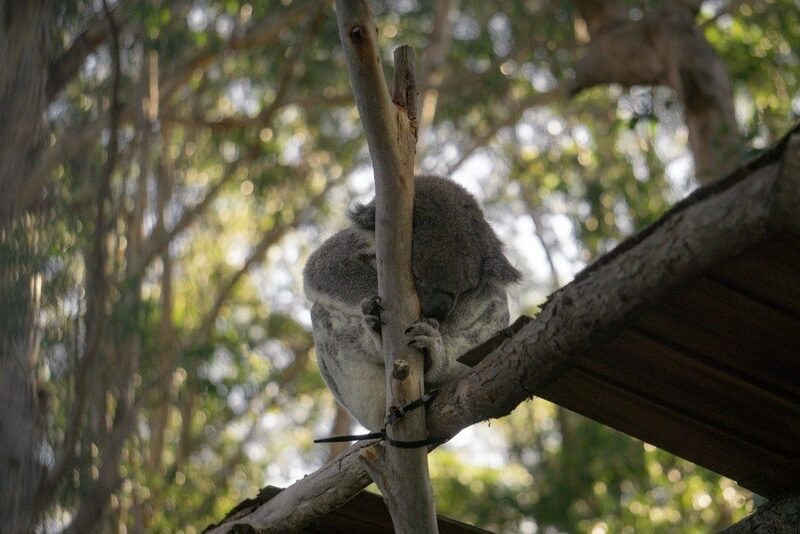 The Koala Hospital has to ensure that each Koala is able to climb trees and find their own food source before they’re let back into their home range and the rehabilitation section is where they do it. As I mentioned earlier, it’s screened off at ground level but high above the walkways, you’ll be able to see juvenile and healthy Koala getting ready for their big day. You’ll also hear about previous success stories and mischievous Koala who keep making their way back to the Hospital for a visit. 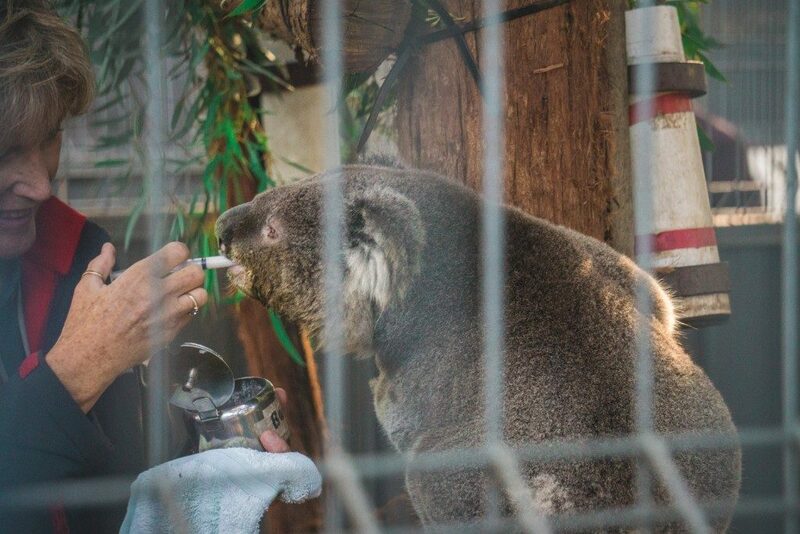 The final part of your visit to Port Macquarie Koala Hospital will be to the treatment room. 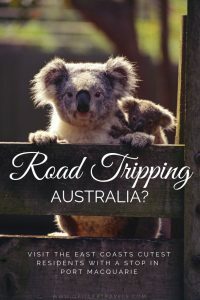 If you’re lucky, you might be able to see a routine check-up of the baby Koalas, or you might, unfortunately, see a new patient being bought in. The treatment rooms large viewing window means it’s open to all visitors no matter what time you’re there, it just depends if they have a patient in or not. If you do want to see them at work, you can even call ahead of time to see if they have any treatments planned for that day, they’re more than happy to let you know rough times so you can plan your trip accordingly. If the tour or walk around the grounds wasn’t quite enough for you, their mini Koala museum is a great way end to the day. Test your knowledge and see if you’re Koala-fied in Koala care (… sorry) with their interactive quiz. This part is great for kids, especially as the tour is a lot of looking and listening, so the mini-museum lets them get hands on and learn the fun way. Habitat loss thanks to construction sites. Traffic incidents are also on the up because they’re having to travel over new roads and through housing estates to find food. 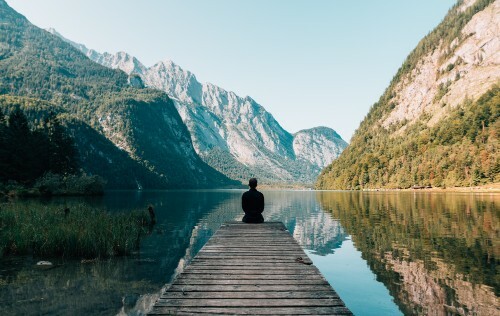 Then on top of this, researchers have recently found out that stress brings out the Chlamydia disease that’s present in a lot of wild Koala within New South Wales, this spreads fast throughout the population and is another contributing factor. 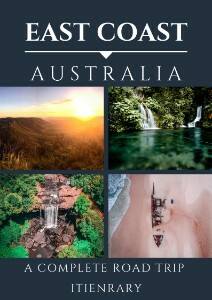 Put simply, no trees, no koala. Plant a food tree. We found this list of the trees koala like to eat if this is something you could do. Keep your dogs on leads/secure in yards and keep your cats inside. Domestic, non-native animals stress out the Koala, especially dogs who will chase them while they’re on the ground. Adopt a Koala. Places like Port Macquarie Koala Hospital offer Koala adoption packs, you’ll receive monthly updates about your koala, a Koala teddy and a selection of other goodies too depending on where you adopt one from. Donate to a Koala charity like The Koala Hospital or Save the Koala. Volunteer. If you live in Australia, you could volunteer at your local wildlife/koala rescue. They always need plenty of helping hands, especially to pick the daily leaf feed! Take a visit to Port Macquarie Koala Hospital and donate! Are you looking for a new Travel Journal that won’t harm the planet? Check out this eco-friendly journal and get 10% off! 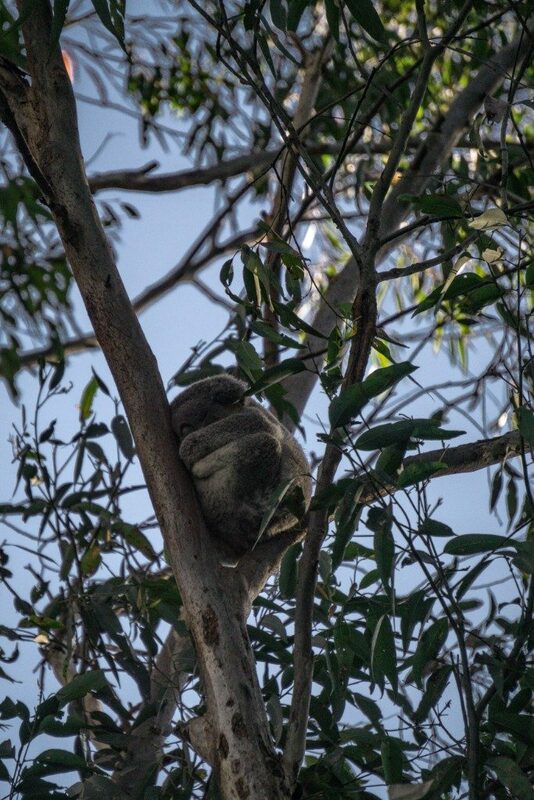 While Koalas like to live in their own tree, they’re actually very social animals and have a hierarchy system with the other Koala around them. The dominant male and female will have the best trees, filtering out to the older or sick Koala who will live on the outer edges of the habitat where food is less readily available. They’re not bears! They’re marsupials, meaning they carry their joeys in a pouch just like a kangaroo! The gestation period (pregnancy) for a Koala Joey is just 35 days! 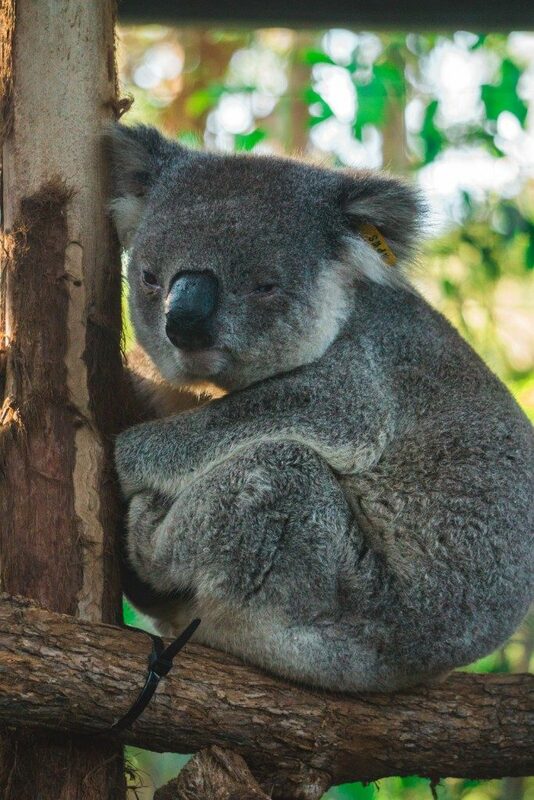 Koalas vary slightly from each Australian State. They get smaller with thinner fur the further north you get, with Victoria having the biggest (and healthiest) Koala of the country. This little lady loves her naps almost as much as she loves her food. We really enjoyed our visit to Port Macquarie Koala Hospital. While a little sad, it was really nice to see so much being done by the volunteers in the area to help support the wild Koala population. We bought ourselves a badge to remember the day and donated what we could. If we lived in the area, I’d definitely be volunteering my time there. 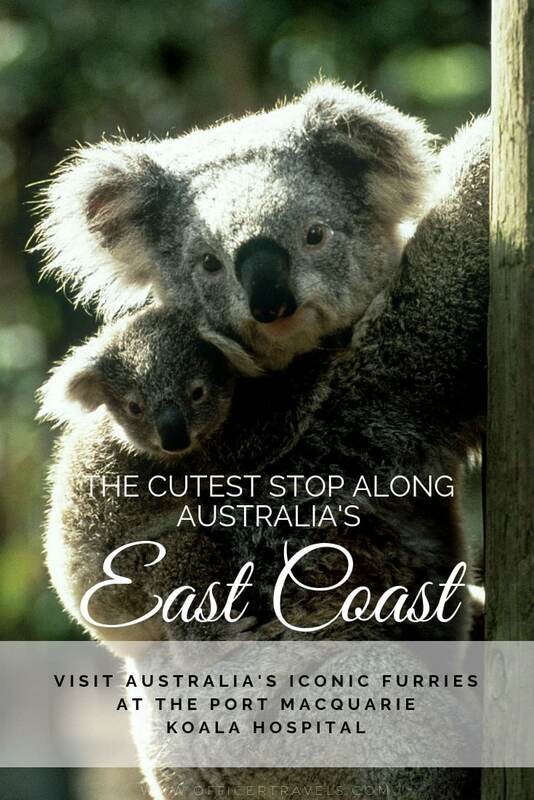 Got a koala picture to share? Tag us on Instagram @officertravels and don’t forget to use #saveakoala throughout September to help raise awareness! Have you got a charity similar to this in your area? What wildlife do you have in your country that needs help? We’re always curious about these things so drop us a comment or even get in touch on one of our socials! Only crazy people would sell their home and belongings, then move to the other side of the world…right?! 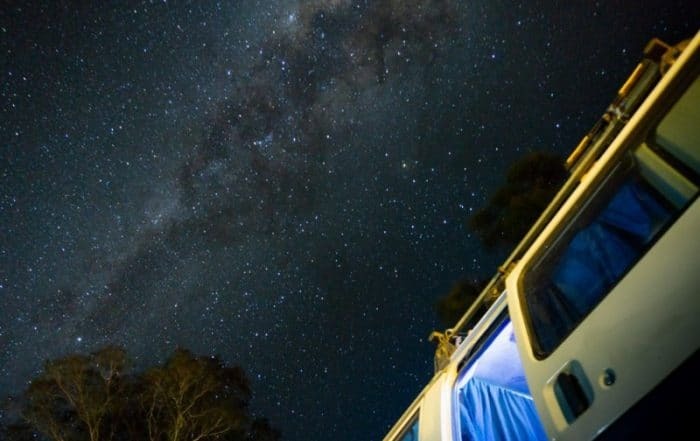 10 UNIQUE places to see between SYDNEY and BRISBANE – Road trip ideas. Our favourite DAY TRIPS from SYDNEY – You won’t want to miss these! 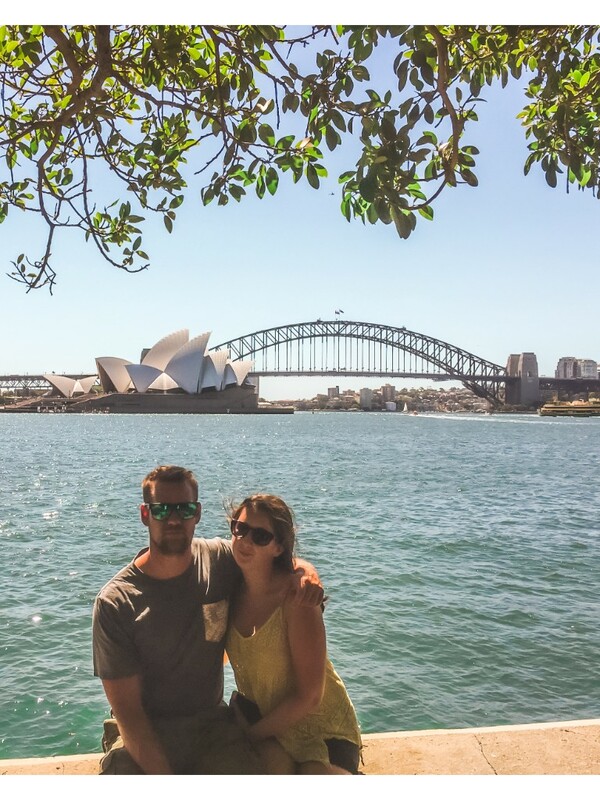 Whale watching in Sydney – A day trip to remember! Absolutely love Koalas so really enjoyed this post, especially knowing they are being cared for and looked after 🙂 Love the facts as well! 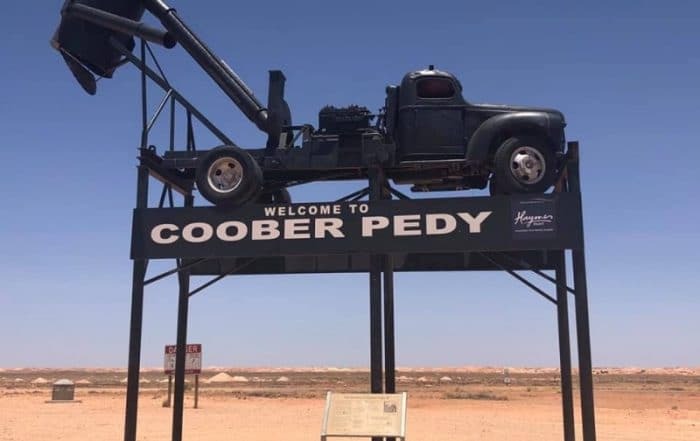 Thanks for sharing – its another thing to do on the ever-growing list!